Today I was perusing the new arrival section of the J. Crew Factory website and I thought, "Wait! I basically have all of this stuff in my closet already!" One of the nice things about the J. Crew Factory is that they take popular items, prints and styles from seasons past and offer them the next year at a much more reasonable price than the retail store. This is especially great if you missed out on something that you wanted the previous year at J. Crew. In this post I'm featuring some photos from previous posts that feature items that have now been reinvented or re-released by the J. 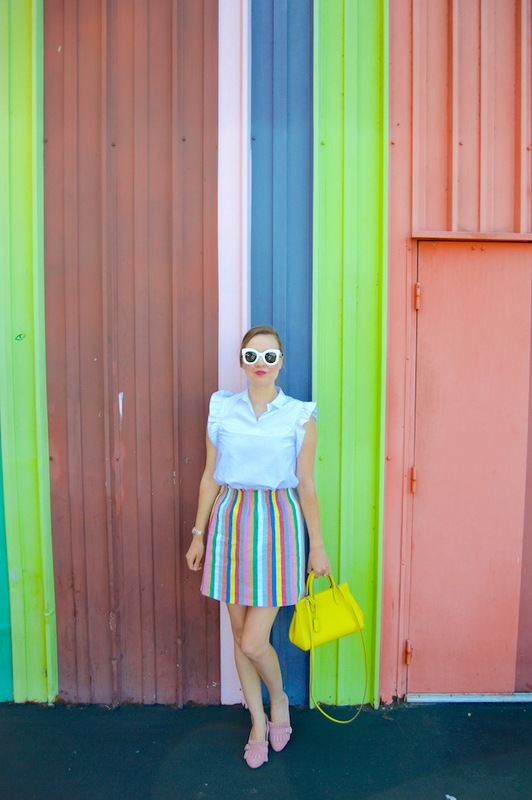 Crew Factory for spring, starting with this fun rainbow colored skirt! This rainbow skirt from J. Crew Factory was one of my favorites last year. It's super comfy and super colorful, so it's definitely a win win! The J. Crew Factory has come out with pretty much the same version of the skirt for this year, just in slightly more pastel shades. They also have an off the shoulder dress version in the same pastel rainbow pattern, which is adorable for summer! Next on my list of new arrival loves from J. 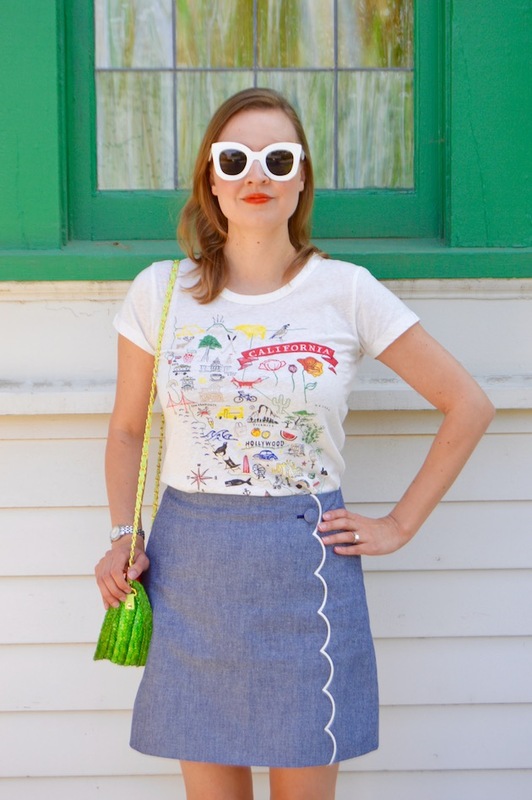 Crew factory is my scalloped chambray skirt and California tee. This scalloped skirt takes a simple denim/chambray skirt and elevates it with the button and scallop detailing. And how cute is this tee? I just love all of the cute cartoon representations of some of California's most beloved and iconic attractions. It should be a staple for anyone living in California or any one who wishes they could! Below you can see that both of these items are now back again, courtesy of J. Crew factory! It looks like they kept the design of both items true to the originals that were released by J. Crew, which is always nice. Additionally, J. 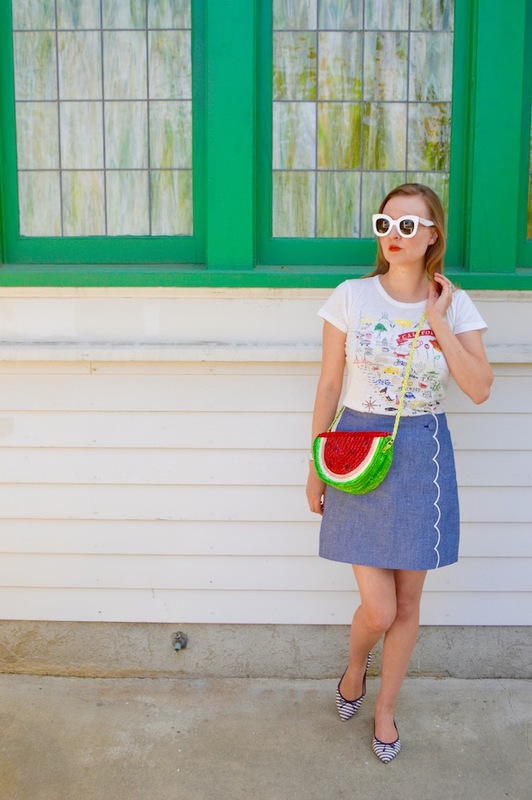 Crew Factory has a kids version of this watermelon bag, which matches the watermelon in the tee shirt to a tee! Oh my gosh thank you so much for sharing these - I NEED both of those skirts!! Gorgeous! I was excited to see the rainbow skirt back too! I also picked up a London graphic tee, so cute! Two super cute looks! 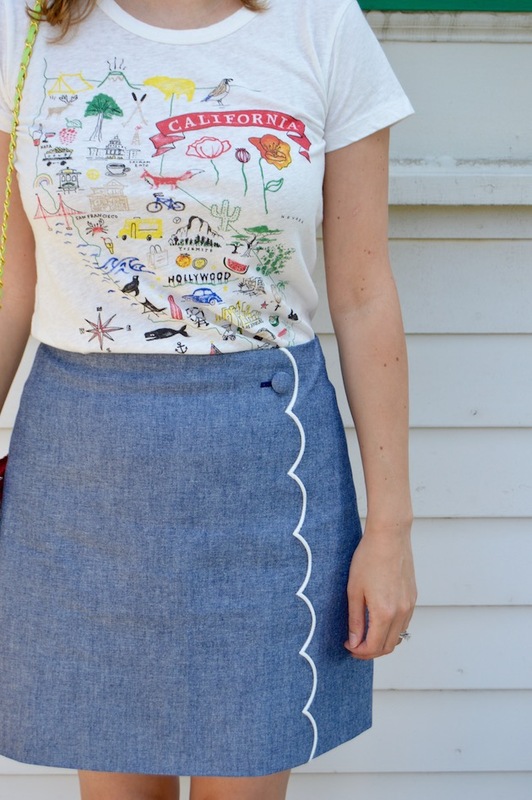 I am adoring the chambray scalloped skirt. So fun with the graphic tee and striped flats. Thanks for linking up, Katie!